Once in a while a pedal company comes along that makes exceptional gear. This is not to say that other companies put out inferior products. It’s just that sometimes someone is so dedicated to an idea or product that they spare no expense. Designer and manufacturer Phil Taylor and his company Effectrode produce uncompromisingly good pedals. They’re for people who know what they’re looking for. You can tell pretty quickly that the sound quality of every Effectrode pedal is in a league of its own. The tone is refined, to say the least. Phil clearly isn’t thinking about cutting corners when designing these pedals. He’s dedicated to quality and tone. It’s for this reason that Effectrode pedals are made in limited runs. Phil makes them in small batches. Handmade isn’t a word he throws around. I admittedly own a lot of fuzz pedals. Some would say maybe too many. But I don’t keep people in my life who would say such hurtful things. There are some staples when it comes to fuzz. Many of us have heard of the Fuzz Face, the Big Muff, and the Tone Bender. But very few of us have experienced a tube-based fuzz pedal. That’s because these fuzz pedals don’t really exist. Well, that is until Effectrode released the Mercury Tube Fuzz, in 2015. For those who don’t know this, all pedal circuits that Effectrode makes are tube-based. Open the booklet that comes with the Mercury and you’ll get a little history lesson on the pedal’s components. The tubes are N.O.S. Sylvania subminiature twin triodes, originally invented for military radar systems in the 1940s. In fact, a lot of tube technology was fueled by the military. It’s great that war-funded tech has moved on to more inspirational uses. The Mercury Tube Fuzz reacts differently from a transistor-based fuzz. One notable difference is the way it cleans up. Some fuzz pedals seem to have a gradual incline, gain-wise (when you use the guitar’s volume knob), until you reach about 8 on the guitar. And then the fuzz just seems to erupt. In other words, most fuzz pedals aren’t so subtle. The Mercury has an even increase as you dial up the guitar volume knob. 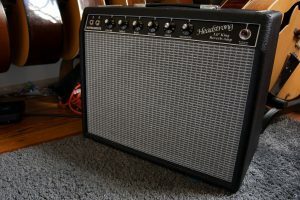 Unlike with the Big Muff, the tones of the Mercury with rolled-back guitar volume are pleasing. The Mercury can scream or be subtle. This makes it quite versatile. The Mercury pairs well with other gain pedals. I love it before the Effectrode Tube Drive. 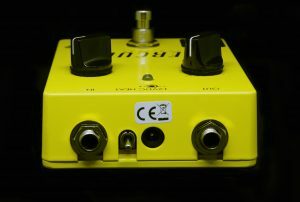 I’ve also had great success pairing it with more midrange-centric pedals such as the Tube Screamer. The Mercury isn’t as midrange-rich as other fuzz pedals. I love mine through a Vox or Marshall amp, as well as a blackface Fender amp. The tone is very round, without the low end getting too woofy. Those who have spent time with a Big Muff know how the woolly low end can sometimes get in the way. The Mercury doesn’t lose control of the low end. On the back of the Mercury you will find a switch that engages “plate starving” mode. This allows the second tube stage to be operated at a reduced plate voltage. This creates a harder, transistor-like sound, according to the manual. This is clearly the “more fuzz” switch. But it’s not as simple as adding more hair. As you can imagine, the sound changes more than if you were just adding additional gain. The pedal’s personality morphs a little, too. I like that you have not only more gain as an option but also a different character of fuzz. All examples were recorded using an AEA A840 ribbon mic into a UAD Apollo using the Neve 1073 preamp plugin in the Unison slot. I’m using the neck pickups on this example, with the plate starved switch on. The fuzz is all the way up. You can still hear the pick attack, which doesn’t happen on most fuzz pedals when maxed out. It sounds fuzzy but reacts a lot like a tube amp. This makes sense: there are tubes in it. And even though this is in the plate starved mode, it still has more of that tube loveliness than a transistor-based pedal. I want you to hear how chimey the Mercury can be. Some fuzz pedals have a ring mod overtone when playing chords or intervals. The Mercury is clear, without dissonant overtones. It works well with a Vox for arpeggiated parts you wouldn’t normally associate with fuzz. Wanna hear some blues? Here is a cut from a session I just did. I’m using the neck pickup on my Les Paul Standard with Florance PAFs. I don’t have the starve switch up. There is a lot of sustain but I’m still able to retain dynamics. I don’t have the Headstrong very loud—it’s at 2. I’ve mentioned how the pick attack still comes through. This also means that sometimes the pick can be percussive. It’s an interesting combination of chunky and articulate. Hard to find both in a pedal. I’m playing finger-style in this example, with the neck pickup. I want to highlight again that even with the sound fuzzed out, there is a clarity to it. You can clearly hear the intervals, with no pesky dissonant overtones. The sound is warm but not tubby. Digging into punk rhythm guitar so you can hear that the sound is articulate but loose. The Mercury doesn’t feel sterile or tight. Yet the sound is clear. I really like playing rhythm guitar with the Mercury. It’s full but doesn’t get lost in the mix, like a lot of fuzz pedals do live or in a big mix. Another example of how low notes react with the Mercury. The Mercury pairs well with the Effectrode Tube Drive. I love this fuzz pedal cascaded with overdrive pedals. Especially with the Tube Drive. I’m not pushing either pedal’s gain too hard. The point is how they stack. Rather than just turning one pedal’s gain all the way up, I sometimes prefer to stack two pedals. I also use the cascading method when I have to record in an environment with volume restrictions. I use the Tube Drive to get the “amp on 8” sound and then add fuzz from there. One important question when deciding on a fuzz is, how does it clean up? Fuzz pedals don’t all react the same way. A Tone Bender cleans up differently from a Fuzz Face or Big Muff. The Mercury has the most even response to volume adjustments. Some fuzz pedals seem to jump in saturation between 8-10 on the guitar volume. The Mercury doesn’t. This could be a real plus for players who need more refined volume roll-offs. I stumbled onto this sound when preparing some tones for my instrumental project Future Relics. This wouldn’t normally be a situation where I would use a fuzz. But you can hear the versatility of the Mercury. I have the Mercury gain set fairly low. I’m cascading pedals again. The fuzz really adds a stage of compression and slight grit. Later in the chain, we also get a little compression from the analog preamp in the SDD-3000. 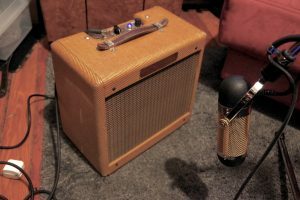 The Tube Drive smooths the tone from the Mercury. This isn’t normally a situation where I would reach for a fuzz. But I thought it would be interesting to highlight unusual uses. The Mercury pairs well with a naturally overdriving tweed. 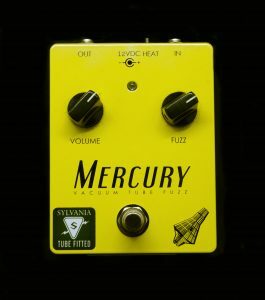 In fact, I dare say that the fuzz on the Mercury has a very tweed-like tone and feel. More so then any other tweed-voiced pedal. The Mercury isn’t tweed-voiced or trying to emulate one. There’s just something about the nature of the tube’s saturation that reminds me of a cranked tweed. I really loved this combo with my Victoria and plan on using it a bunch more in appropriate applications. I just had to play a Led Zeppelin-inspired example. Jimmy played a Telecaster into a Tone Bender MKII into a modded Supro amp on the first Zeppelin record. This is a very different signal chain. I wanted to see if I could get some of that character with the Mercury. Sounds good to my ears! The Mercury Tube Fuzz does its own thing. It doesn’t sound like a Fuzz Face or any other classic fuzz circuit. It’s not a copy of what’s been done. I would say after using the Effectrode Mercury with a variety of guitars and amps that’s it’s quite versatile. It’s turning out to be one of my favorite pedals for gigs and sessions.